Surfacing in 1947 with interests in real estate, followed by stock-broking, late Haji Abdul Karim Dhedhi (may he rest in peace) laid the foundations of the legacy that has come to be the resilient AKD Group - one of the premier business enterprises of Pakistan. Mr. Aqeel Karim Dhedhi, son of (late) Haji Abdul Karim Dhedhi, continues the legacy as the chairman of the group. With his transformational entrepreneurial vision, the AKD Group has evolved into a vibrant, impregnable set of business enterprises operating in key sectors of Pakistan’s economy, including financial services, telecom, infrastructure, manufacturing and natural resources. Transforming the theoretical 'first mover advantage' into a pragmatic reality, Mr. Dhedhi’s awe-inspiring philosophy is exemplified in many of his initiatives. AKD Securities was the first to launch a state-of-the-art Online Stock Trading service in Pakistan and remains the leader in this arena today. Striking the perfect balance between impeccable style and robust structure, Karachi’s skyline transforms into abyss of wondrous possibilities with The Arkadians’ 13 tallest premium residential towers, six office enclaves and utility spaces. 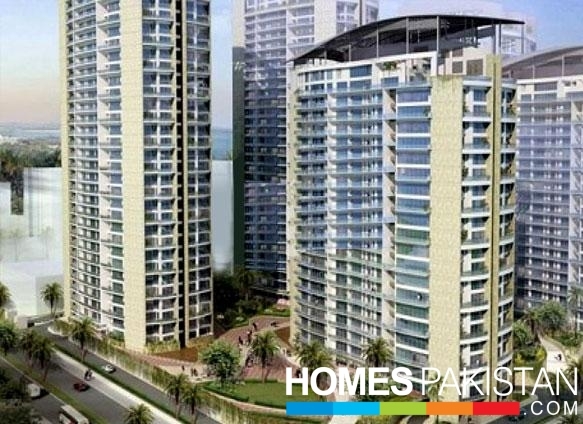 Intimidating the open skies with sheer heights, the majestic towers loom over the financial hub’s most coveted neighborhood and span voluptuously over an area of about 43 acres – a royal dream in the making. Own a piece of the city’s magnificent centerpiece at unprecedented heights. Own Karachi. Striving to achieve unmatched proximity with nature, living at The Arkadians is experiencing the mesmerizing ingredients of the ‘real’ greens and blues of nature. Hovering majestically over the luscious DHA Golf and Country Club on one side and eavesdropping gracefully on the serene ripples of the Arabian Sea creek, The Arkadians serve up a quintessential Karachi cityscape vantage point – a perfect blend of style, function and ingenuity, an emblem of luxury and a beacon of modern lifestyle. Monotonous life transforms into an assorted array of surreal experiences with the rhythm of the waves and shimmering ocean opulence a glance away at all times. The master plan effectively transforms dynamic lines of the rivulets emptying into the Arabian Sea and the wind-carved shores into naturally-inspired architecture which finds its robust structure dipped in natural purity. Developing the compelling forms of the towers from the local landscape, the mega project serves as an emblem of uniqueness. Notwithstanding top-of-the-line international contemporary architecture, the design subtly maintains sensitivity to local climate, geography and culture to provide unmatched sustainability. Comprising wide, full-height and double-height terraces, life-size windows and temperature-sensitive screens, the towers crown your life with unparalleled proximity with nature’s finest.Experience an architectural marvel as you stroll down The Arkadians’ mesmerizing walk – a purpose-built pathway designed as a mirror image of the very waves surrounding your unique home. In a city of superlatives, we defy the odds. Indigenously embedded with a multi-layered security protocol system, The Arkadians conceptualize in essence the idea of a ‘gated community’. Honed with unprecedented and fool-proof security measures, the project boasts round-the-clock surveillance via closed-circuit CCTV cameras, automatic security gates, fences and access control barriers atop security personnel manning all the entry and exit points. With state-of-the-art security precautions, dreams are only forthcoming. With a total of 140 apartments and 274 parking spots, each floor in Tower A has 6 flats, 5 high-speed passenger and cargo elevators (1 Private for Duplex/Penthouse, 4 non-private), 4 garbage chute facilities and 2 staircases. Laying the bedrock of your unique home on the pure tenets of Simplicity, Harmony and Functionality, Pakistan’s leading Interior Designer Naheed Mashooqullah has created each home with a perfect blend of indigenous and royal mix which transcends into the perfect modern living with a pinch of royalty. Mashooqullah, a highly consummate interior designer, has fashioned an unfathomable artistic fusion of contemporary and vintage paradigms to path way for your perfect home. With a choice of 2-bed (58 units), 3-bed (60 units), 4-bed Duplex (30 Units) and the Penthouse (2 Units) – take your pick. Spacious audacity and unrivalled style is embedded inherently within the design of each home. Coupled with international fixtures and fittings, panoramic 360-degree views, extravagant baths, wide corridors, physical transparency and kitchen equipped with state-of-the-art equipment, The Arkadians redefine the meaning of modern-day living. Nested majestically atop Tower A, the Penthouse symbolizes the epitome of imperial living. With a total area of 16,445 sq ft, the exuberant 5-bed double-story Penthouse is as close as one could be to heaven. Flaunting its dauntingly wide terraces, two decks, private study, spacious dressers, 3 car parking areas and a swimming pool at an unimaginably pleasurable height, the Penthouse is your new nest suspended magnificently in the midst of the city sky. 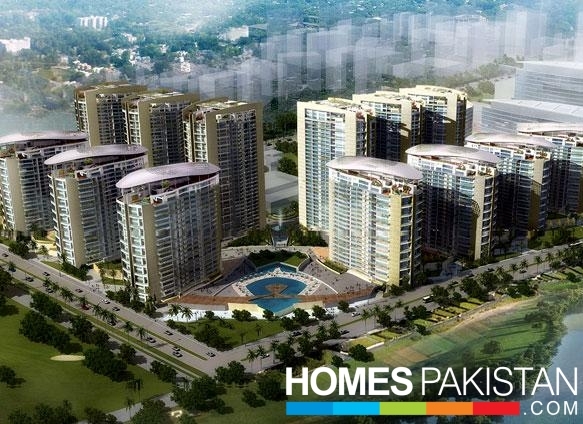 The Arkadians is irrefutably Pakistan's most prestigious address which offers its limited number of privileged businesses and homeowners luxury and personalized services. This is where the collision of crucial forces takes place. This is where your 'home' meets the market. 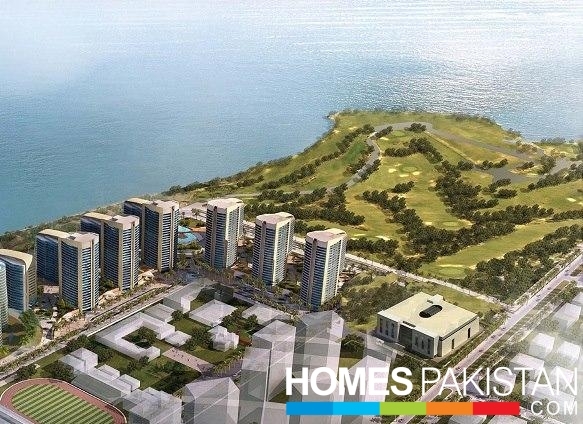 Aspiring to be the business and commercial centerpiece of Karachi, The Arkadians is also home to 6 purpose-built top-of-the-line office enclaves.Where luxury residential living intercepts the high-end Business Bay, enter the 'gated community' which has no peer and stands impregnable in all its glory. Craftsmanship at its finest. 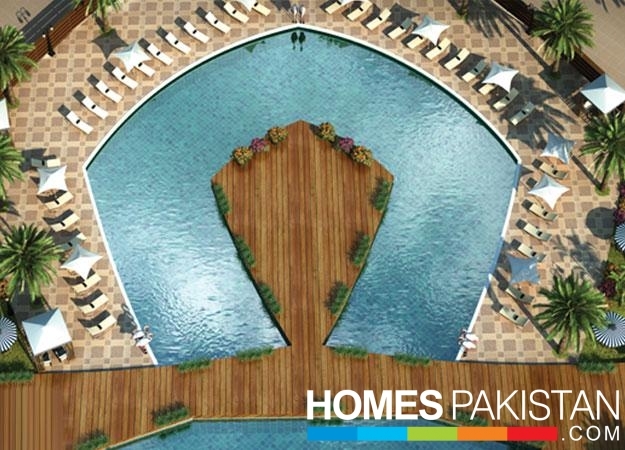 At the exquisitely-designed life-size Pool Deck of The Arkadians, temperature-controlled water treats await you. Kick back and relax at the finest swimming facility built in the city. Sipping your favorite cocktail under the Caribbean-style umbrellas, soak your feet and revel in guilt-free pleasures as the sun dives in to the ocean not far from you. In the land of magic where dirt is gold, Let’s Play; As you plan an intimate afternoon of pampering with golf and spa at the Arkadians, let your kids loose in the city’s most desired and safe indoor recreational areas. Let your child’s nascent freedom, innocence and imagination run wild at the quintessential play area. This is where your young ones grow up; this is where they learn how to walk and fall – because at the Arkadians falling down is not a symbol of failure, its one step closer towards robust success and progress. Enter the land of magic and delight -- a land where the very first dreams are dreamt. The impeccably-styled Community Hall, located perfectly next to your home, is the perfect spot for your customized parties and gatherings. Celebrations become the order of the day as your guests enjoy fine dining at the best the city has to offer. Living at a bay has its own perks. Plan your most desirable weekend with activities that rejuvenate the mind and the soul. You name it: sailing, canoeing, jet skiing, parasailing, speed boat rides, surfing, diving. We have it all. In the bustling city of The Arkadians which never sleeps, we provide you with the privacy your business needs demand. With state-of-the-art equipment and exquisite design in the customized Conference Rooms, your business is in good hands. Where you meet important guests urgently in complete confidentiality, The Arkadians is the only residential project providing this purpose-built state-of-the-art facility. Where you revitalize your soul and rejuvenate your body. Where the unison of the mind and the body takes place. Enter the world of deluxe seclusion. Enter the spa. The Arkadians is where luxury and fitness go hand-in-hand. Other than parks and play areas, The Arkadians flaunt a flawless tennis court facility with unmatched maintenance to provide you with fine sporting extravaganza. Revel in joy when you know your fitness needs are just a few steps away from home. Your time to dwell and unwind. With a stunning collection of books to remember, our library is an added fringe benefit for the residents. Pick your coffee mug and slip into the comfortable sofas with your favorite book in hand. Life never felt sweeter. Please enter your email address and get latest updates about our projects delivered to your inbox.